While everyone is quite impressed with the Chat Heads feature introduced in the Facebook Messenger recently, the app received yet another update today and got the new Facebook stickers. The stickers for Facebook Messenger are funky little fatheads which can be used in place of the emoticons. By default there are a few stickers available. You can add new set of stickers to your collection by downloading them from the sticker store for free. Even though the stickers are not available on the desktop version of Facebook, they can be seen in the chat message on the desktop. To send a sticker, after updating the Facebook Messenger app, all you have to do is to click on the smiley face in the text box and select the appropriate sticker from the collection. So what are you waiting for? 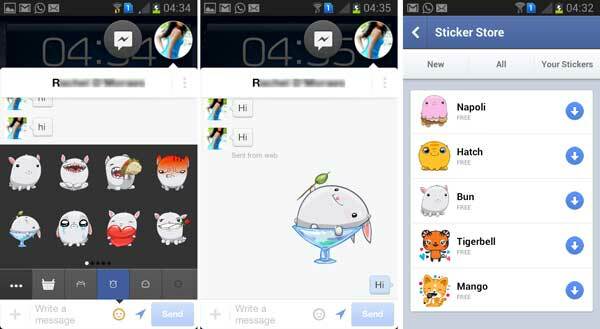 Hurry, update your Facebook Messenger app by downloading it from the Google Play Store and have fun with the stickers.